For policymakers, adolescence presents an invaluable opportunity to ensure that all young people can access the high-quality services and supports they need to improve their odds of becoming successful, healthy, productive adults. At an historic moment when the provisions and breadth of health care reform are under vigorous debate, it is important to take stock of how well the states are currently meeting the health and development needs of all adolescents, and particularly disadvantaged youth. 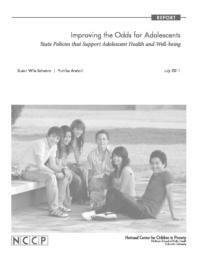 This report presents information from NCCP's Improving the Odds for Adolescents project about state policy choices that affect the health and well-being of adolescents.